Don’t Touch That Dial! Stay tuned to find out who the 3 winners are right here in just at the end of this month, 31th July 2015! Still not convinced? Let’s talk about how ThemeFuse can benefit you. WordPress is the premier online software for setting up and maintaining the most beautiful blogs and websites, and ThemeFuse makes the very highest quality themes for WordPress sites. Whether you have a blog, ecommerce site, online portfolio, or any other type of site, ThemeFuse is your one-stop shop. With beautiful designs and some of the best features for configuring a functional and attractive user interface, source code, and more, you really can’t go wrong with ThemeFuse. 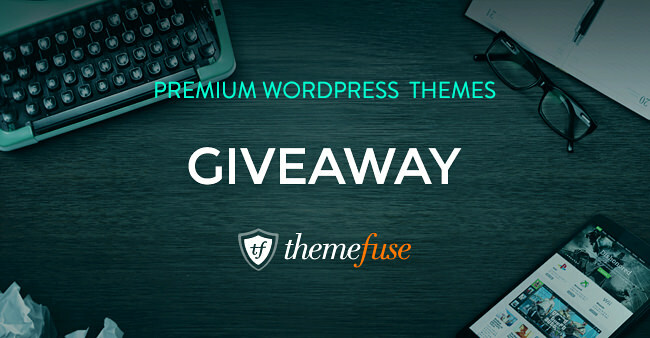 And, even if you’re not one of the 3 lucky winners in today’s giveaway, you can still take advantage of a cool new product that ThemeFuse has just launched in partnership with a trusted hosting company. They now offer hosting services that come with a free domain and completely free setup and installs. You could have your website up and ready to go in just minutes, thanks to ThemeFuse. Find out more about this amazing new product. Now, let’s take a look at some of the WordPress templates that ThemeFuse offers. You could have one of these for free as soon as next week if you’re one of the 3 winners in this giveaway! This theme is not only absolutely perfect for your professional portfolio or personal blog, but it’s also beautifully suited for posting videos, photos, and links, all from your iPhone. This theme is kid-friendly, responsive, colorful, and fun – Great for a daycare center or kindergarten’s website. Both highly powerful and very user-friendly, this responsive, professional WordPress theme can take your business’ site to new heights. This multipurpose theme is incredibly versatile, making it a great choice across industries and for more casual, creative shop sites, too. What are you waiting for? Follow the three easy steps to enter, and you could be one of our 3 lucky winners next 2 weeks! I’m in, thanks for ThemeFuse and NARGA!